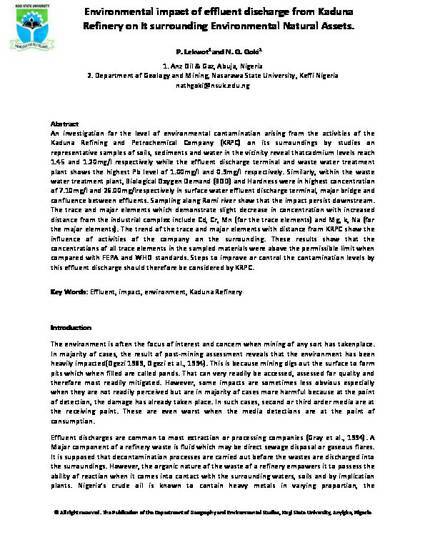 An investigation for the level of environmental contamination arising from the activities of the Kaduna Refining and Petrochemical Company (KRPC) on its surroundings by studies on representative samples of soils, sediments and water in the vicinity reveal thatcadmium levels reach 1.45 and 1.20mg/l respectively while the effluent discharge terminal and waste water treatment plant shows the highest Pb level of 1.00mg/l and 0.9mg/l respectively. Similarly, within the waste water treatment plant, Biological Oxygen Demand (BOD) and Hardness were in highest concentration of 7.10mg/l and 26.00mg/lrespectively in surface water effluent discharge terminal, major bridge and confluence between effluents. Sampling along Romi river show that the impact persist downstream. The trace and major elements which demonstrate slight decrease in concentration with increased distance from the industrial complex include Cd, Cr, Mn (for the trace elements) and Mg, k, Na (for the major elements). The trend of the trace and major elements with distance from KRPC show the influence of activities of the company on the surrounding. These results show that the concentrations of all trace elements in the sampled materials were above the permissible limit when compared with FEPA and WHO standards. Steps to improve or control the contamination levels by this effluent discharge should therefore be considered by KRPC.